In a series full of lost leads, ridiculous amounts of goals, and more than its share of penalty minutes, it didn’t seem like the first 30 seconds of any game would mean much come the final horn. “Before they dropped the puck, he came over and told me to watch the first shift,” Danny Briere said. Giroux made sure to put on a show for his fellow assistant captain and everyone else watching Game 6 between the Philadelphia Flyers and Pittsburgh Penguins. Just a few seconds into the game, he leveled Penguins’ captain Sidney Crosby with a clean hit in the neutral zone. The 23-year-old all-star was going to do anything in his power to ensure that there wouldn’t be a Game 7 in Pittsburgh. Just a few seconds after the big hit on Crosby, Giroux skated up the rink and fired a wrist shot past Marc-Andre Fleury to give the Flyers a lead that they would hold for the rest of the game. Giroux was more than fired up after the goal. He shouted “Let’s go!” as he slammed into the glass at the Wells Fargo Center, much to the delight of the fans sitting in the first few rows. It was a much different feeling than the one Giroux had at the end of Game 5, when he shattered his stick over the crossbar in frustration after falling to the Penguins 3-2. As impressive as Giroux’s first shift was; it almost didn’t happen. Peter Laviolette had played his checking line, or Sean Couturier, Max Talbot, and Eric Wellwood, against Pittsburgh’s top offensive weapons plenty of times throughout the series. So why, in Game 6, did the Flyers’ coach choose to go with Giroux’s line to start the eventual series-clincher? Be a leader by example by demanding the first shift? Check. Set the physical tone of the game with a huge hit on the opponent’s best player? Check. Give your team a lead just 30 seconds into the game? Check. 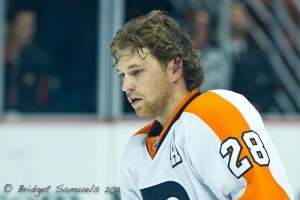 You can’t ask for a better first shift then Claude Giroux’s 30 second hockey clinic at the beginning of Game 6. The rest is history, as the Flyers went on to win the game 5-1 and take the series 4 games to 2. Below is the video of the hit on Crosby and the game’s first goal, both delivered by number 28.